← Picture of the Week – Boulted Bread! Spring is always a happening time in the Triangle and this weekend is no different. This week’s picks start with notable local beer news on Thursday followed by some fun outdoor and music events happening over the weekend. No matter what you end up doing I hope this list of things to do in the Triangle helps you discover something new about the area and get out side to enjoy this great warmer weather! The people behind Sam’s Quick Stop are opening up a huge craft beer bottle shop on NC 54 in Durham. Grand Opening is this Thursday. Read all about it here. The Triangle’s newest brewery launches this Thursday with a soft opening starting at 5pm. This brewery is the first one in the area to be located in Apex. Check out their story and list of beers on their website. Each Friday 11:30 am-1:30pm at 800 Park Office Drive in RTP. They typically have between 4-6 trucks. Outdoor seating is provided and you’re welcome to bring picnic blankets, frisbees or hackysacks. Archibald Motley includes 42 works from each period of Motley’s lifelong career, from 1919 to 1960. Motley’s scenes of life in the African-American community, often in his native Chicago, depict a parallel universe of labor and leisure. His portraits are voyeuristic but also genealogical examinations of race, gender and sexuality. Enjoy a day of free activities with your family, friends and neighbors. 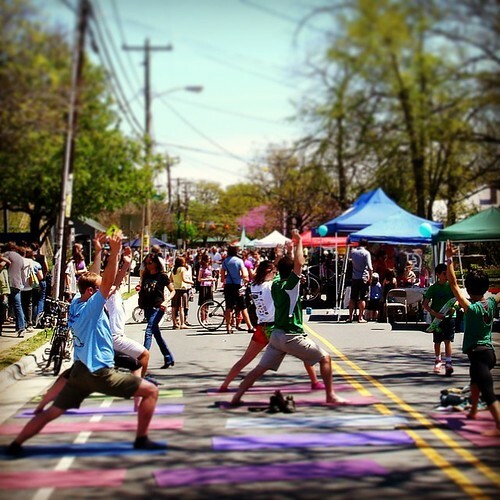 Bike, walk, skate, dance and play in a traffic-free public space on West Weaver Street, closed to cars Saturday from 10 am to 2:00 pm. Saturday morning Sola hosts 15 local artisans at their Spring PopUp Market. These events feature local artists and crafters selling unique locally made products. Market runs from 10am-2pm. Then Saturday evening Sola turns back the clock with some good old fashion jazz music with the band Tea Cup Gin. They play jazz and show tunes from early 20th century. Tea Cup Gin draws inspiration from performers such as Jelly Roll Morton, Fats Waller, and Billie Holiday. Music starts at 7:30pm. Food, beer, and coffee served all evening. On Sunday 12,500 runners will descend on downtown Raleigh. It is always fun to watch these races and cheer on the competitors, but this race will have some added entertainment with musical performances scheduled in the morning and afternoon at the Red Hat Amphitheater. Check the even website for the full music schedule and showtimes! it very bothersome to inform the reality however I’ll definitely come again again.